As an employee, there are always things that we dislike about our boss. Because our boss is human and they don’t think exactly like we do. There is another aspect to this situation. Most people have no idea what it is like to be a boss. The responsibility. The demands. The questions and situations that do not have happy answers. They are real. We need to be employees that consider what our boss has to do. And we need to be nice about it. And as a boss, there are ways to get the best out of people. The best bosses are not necessarily the smartest bosses. The best bosses are not necessarily the hardest working bosses. They are the ones who know how to get the most from their employees. And that has never been a whip that does that. I read in the April 2018 Toastmaster magazine about the I.N.S.P.I.R.E. feedback model. Because all fantastic bosses listen to feedback from their peers, their bosses, and their employees. This method is supposed to help draw attention to performance issues, encourage mutual discussion, and confirm commitment to new behavior with short, specific conversations. PROBE: After you present the situation, the other person needs a chance to talk. As a question in a neutral, curious tone to allow them to share any relevant information. “What happened?” works and allows the person to share information or to own the situation. Seems like good advice for all of us. In work. And with our family. Hope to see you at the Fajita (chicken), Margarita (virgin), Loteria (bingo) night on July 22. 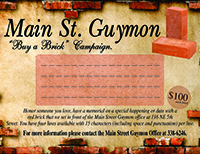 It’s $10 a plate with the proceeds going to Main Street Guymon and the Loteria cards are $1 a game, with ½ going to the winner and ½ to Main Street Guymon. The fun starts at 4 and ends at 7 pm. It takes place at the RC Party Room, 5th and Main. And Friday evening is our Summer Aggie Family Pot Luck and Game Night with the OPSU Football players who are here this summer. If you would like to join, bring some food and your favorite game. We meet at 6 pm at the OPSU ballroom. For more information call Melyn at 338-6246.